Soundness of cement is the ability of a hardened paste to retain its volume after setting. A cement is said to be unsound (i.e., having lack of soundness) if it is subjected to delayed destructive expansion. Unsoundness of cement is due to presence of excessive amount of hard-burned free lime or magnesia. Soundness of cement indicates quality to expand on the setting. Unsound cement expands too much on setting and develops cracks in the structure. By soundness of cement, it is understood that, its capacity to form a non-disintegrating, hard uniformly strong mass on the setting. This depends on its original composition, proper burning, and grinding. Presence of lime in the free state, an excess of sulfate or magnesia and a very fine size may be the cause of soundness in cement. 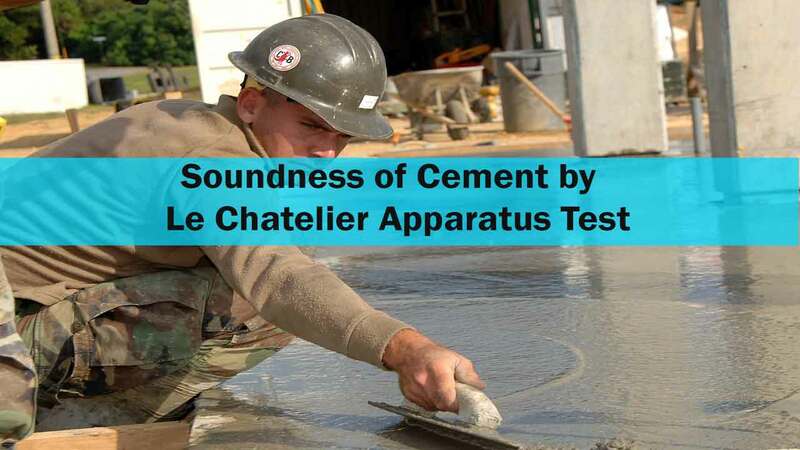 The Indian Bureau of Standards has specified the le chatelier apparatus test – the same as adopted by British and American Standards for soundness test of cement. Read More: Cement Manufacturing Process: What is Cement made of. It consists of a small, split, metallic cylinder having an internal diameter of 30 mm. It is 30 mm in height, with the thickness of wall being 0.5 mm. It is fixed with two indicators, one fixed on either side of the split. The distance from the end of the indicator to the center of the cylinder is 165 mm. Other apparatus used in the Le Chatelier Apparatus test are. The cement to be tested is made into a paste of specified consistency. In common practice, 100 gm of neat cement is mixed with water calculated at 0.72 (P) where “P” is the percentage of water required for making a paste of normal consistency. 1. Before commencing setting time test, do the consistency test to obtain the water required to give the paste normal consistency (P). 2. Prepare a paste by adding 0.78 times the water required to give a paste of standard consistency (i.e. 0.78P). 3. Lightly oil the Le-chatelier mold and place it on on a lightly oiled glass sheet. 4. The paste, of the known consistency, is filled in the cylindrical mold, covered with glass sheet and kept under water (at 27 degrees to 32-degrees centigrade) for 24 hours. 5. After which the cylinder is taken out, and the distance between the two indicators is measured (say it is x). It is again immersed in the water. 6. The water is then brought to the boiling point in 15-30 minutes and kept boiling for 1 hour after which the distance between the two indicators is again measured (say it is now y). 7. The difference of y-x gives the expansion of the cement specimen on the setting. 8. It is specified that this distance shall not exceed 10 mm for the cement to qualify as SOUNDNESS CEMENT. Read More: What is Plastering. | Define Plaster, Cement Plasters & Gypsum Plaster. Note: If the sample doesn’t comply with the specified requirements, the test should be done again from the same sample. A good care should be taken while taking the measurements. Do not apply more pressure on the mold while filling it. The water level should not fall below the height of the mold during boiling. The expansion as determined by the above apparatus should not exceed 10 mm. In Cement Mortar and Cement Concrete, the volume expands due to the unburnt lime (CaO) and Magnesia (MgO). Le Chatelier Apparatus test is used to determine the presence of unburnt lime (CaO). The Cracks developed in the structure are mostly due to the unburnt lime because it increases the volume of the cement. Lime and magnesia also react with water and thus increase in volume occur in the cement. Which is also a reason for cracks in the structures. Thanks for Reading. Don’t forget to share this article. Read More: The Ultimate Guide To Portland Cement. did any quantity of cement is specified for soundness test ?